MyUninstaller is a free software uninstaller for Windows that shows lots of detailed information about the programs installed to your computer. This program is completely portable and takes up only a fraction of storage space, making it ideal to keep on a flash drive for uninstalling on-the-go. This program is no longer being updated — this review is for version 1.77, which was released on February 20, 2017. You can still download and use it normally or you can use UninstallView, which is a similar program from the same developers. I mention above that the batch uninstall feature causes cluttered windows. What I mean by this is that when you switch to Advanced Mode from the View menu, and then select multiple programs to remove at once, MyUninstaller will open all their uninstall wizards at the same time, making for a bit of a mess on your screen. 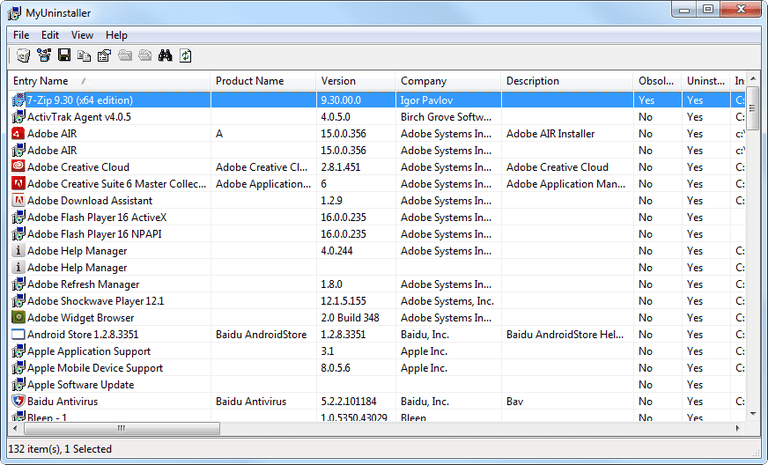 Some software uninstallers support a cleaner batch uninstall, like IObit Uninstaller and Comodo Programs Manager. These two alternative programs are a bit more advanced, also free, and can do other things MyUninstaller can't, such as remove programs from the right-click context menu in Windows Explorer, which lets you delete applications a little quicker than having to open the uninstaller tool first. I also don't care much for the search feature. Found in the Edit menu, it lets you search for text like you'd expect, but it's just not very user friendly, certainly not as nice as the search functions that I've used in some other software uninstallers. I keep MyUninstaller downloaded to my computer but not solely for removing programs, as there are far better sources for that. Instead, I like that it can be used to find the installation folders, Windows Registry information, and install sources for the programs on my computer. This comes in handy when you have a program on your computer that you're not familiar with, as it may help you with identifying how to delete malicious software.